On the edit page of your quiz, in the integrations section, flip the switch below the MailerLite icon and select the group(s) you want to send the leads to. We also support Segmentation, which allows you to send the leads to differents forms according to rules you defined. 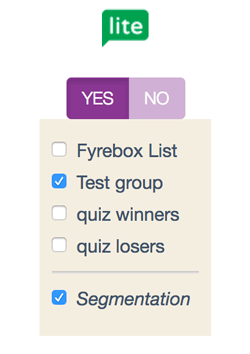 From then on, all leads collected in your quiz will be sent directly to the group(s) you selected. If you have never heard of it:” In 2005 we started as a web design and development agency. After a few years we discovered email marketing and fell in love with it. Since 2010 MailerLite is the only product that we develop. Today MailerLite is a team of 26 designers, developers, writers, speakers, photographers, surfers, chess players, world travellers, dreamers and genuine nice people.